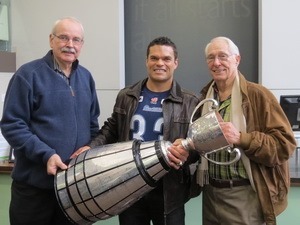 The Grey Cup is the ultimate award for winning the Canadian Football League’s championship game. With two conferences (East and West), each of the eight teams play 18 games from July to November, followed by three weekends of playoffs, ending with the Grey Cup game on the last weekend of November. The games itself climaxes a week-long festival in the host city – this year at Toronto’s Rogers Centre. Somewhat akin to the Super Bowl, it attracts one of the largest TV audiences across Canada. Canada’s Justin Bieber highlighted the half-time show. I belong to a fitness club where Jeff Johnson (#33) was one of the former instructors; he has just completed his eleventh season with the Toronto Argonauts (and is, in fact, their longest playing member of a team that has had its ups and downs over that time). Two weeks ago the Argonauts came from second place in the Eastern Conference season standings to win the 100th Grey Cup game over the Calgary Stampeders 35-22. As a result Jeff was able to take the cup around for a day and dropped by my fitness club with the cup. So what does this have to do with Skype? I overheard one of the club members at the reception, Garry, talking about using Skype video so that a wanderlust friend could see the game half-way around the world. Garry’s friend Doug is a very dedicated Argonaut fan (yes, they have a strongly loyal fan base in the Toronto area). Garry usually spends his winters in Florida while Doug is vacationing in Mexico; they often use Skype to keep in touch during their vacations. However, on the day of the game, Doug was in Singapore visiting his son for a couple of months while Garry was still at home in Mississauga (Toronto). As the game time approached on November 26 Garry and Doug were on a Skype video call using Garry’s iPad 2. Initially they discussed receiving game updates verbally as the game progressed. However, Garry then realized he should try to set the iPad up on a chair capturing his 52” HDTV screen’s video and audio. They positioned the chair such that the iPad captured the full TV screen. Doug, his wife and son were then able to watch the game live on his son’s desktop PC in Singapore. Not exactly a SlingBox setup but it was more than acceptable for viewing. During commercials they muted the TV audio and discussed the game. The Skype connection dropped three or four times over the three hour period but they were quickly able to recover. Garry says that the overall experience was almost as if the five of them (Garry and his wife in Mississauga and Doug’s family in Sinagpore) were sitting in the same room. Garry was on Rogers Express Internet service with 25GB download speed and 2MBps upload, more than sufficient for Skype High Quality Video. Bottom line: The iPad is becoming a major device for convenient Skype calling. It is definitely becoming the default communications mode for travelers; several friends have taken their iPad on vacations as their sole source of communications to friends and relatives back home, whether in Costa Rica, Scotland or at Whistler, B.C. But this story serves as one more example of the level to which innovative users will use Skype video for unique occasions; previous examples include weddings where plans are forced to change at the last minute due volcanoes or medical emergencies. And it’s one more example of WiFi becoming the “stealth” carrier. As this was personal use only, and into a location where the game was not otherwise available, one would have to assume this does not violate any copyright regulations.